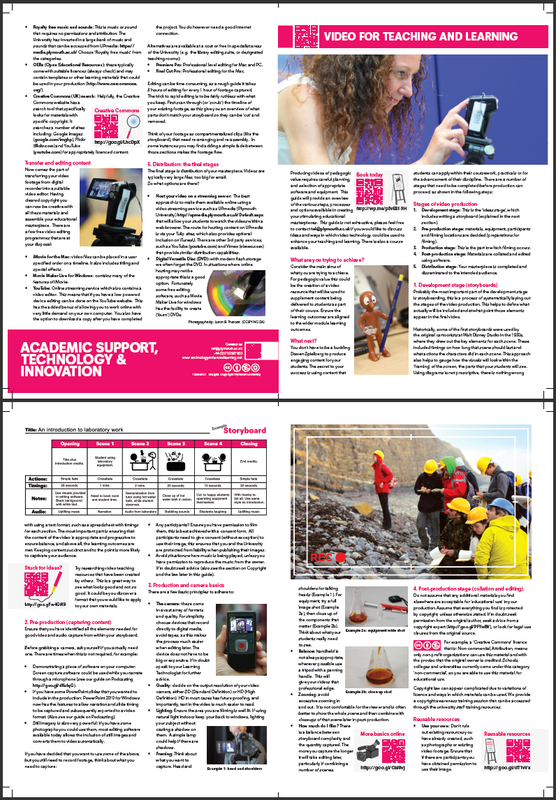 Just completed, published and printed an ASTI (Academic Support, Technology and Innovation) guide I have been working on to help Plymouth University staff get started in the use of video for teaching and learning. I've been using video since my early teens and was very pleased to be able to share some of this knowledge while writing this guide. This 4 pager takes the reader through the stages of video production, pitfalls and includes tips on how to get the best out of their videos. The photos in this publication were taken by me and include an image of Prof Iain Stewart (Geology) with his students on field location, the laboratory photographs are of some equipment used by Dr Roy Lowry (Chemistry) in his own productions for a range of video podcasts that he uses for pre-laboratory work with his students. I was very pleased to have been a supporting member of staff for Roy as part of his Teaching Fellowship. Thank you to Flea Palmer for letting me also use a picture of her on the front cover! This guide is also used to complement a hands on video workshop run by the learning technologist.